The past few days have been a pretty big eye opener from me. I have been sleeping well ( impt to me) ,engaging with some entities, waiting for answers, trying to 'read' the vested interests objectively using publicly available information ( links to the sources are referenced in my articles) , reading up on the electricity market and carrying on with my daily life, spending time with my kid and watching him grow up to be such a adorable and more and more lovable person. Expensive "tuition" fees have been paid ( probably a slight dent in my son's education funds..haha..Don't worry Papa will work harder) and now just to make sure that i learn as much from this episode and not let it go to waste. Moving forward, im so eagerly looking forward to the townhall meetings with Hyflux BUT life beckons and work calls. I may not be able to attend. So these are the questions i hope are being asked and of course if the interested parties are reading this obscure blog, it gives you time to prepare your nicely worded answers. Hyflux raised $400 million in funds from the non-accredited retail investors through SGX in 2011. It is stated ( here) that the funds are used for the water , infrastructure projects and for general working capital. Why did Hyflux commence the daily share buybacks from Nov 2011 to Nov 2015, spending a total of $83 million? Did Hyflux board knowingly raised funds with the intention to use part of it to do a daily sharebuyback since the preference shares were offered in April 2011 and the share buybacks commenced not long after in November 2011? Given that Hyflux operates in a capital intensive industry, what is the rationale for conducting the daily sharebuybacks ? 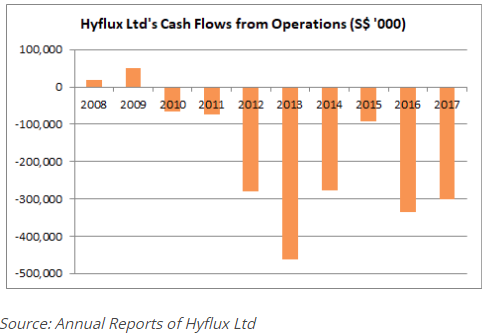 Based on the cashflow of Hyflux, Hyflux isn't getting much cash from its operations . It has in fact been negative every year since 2010. (The effort for this diagram is fully attributed to the good folks at valueinvestasia, not me. 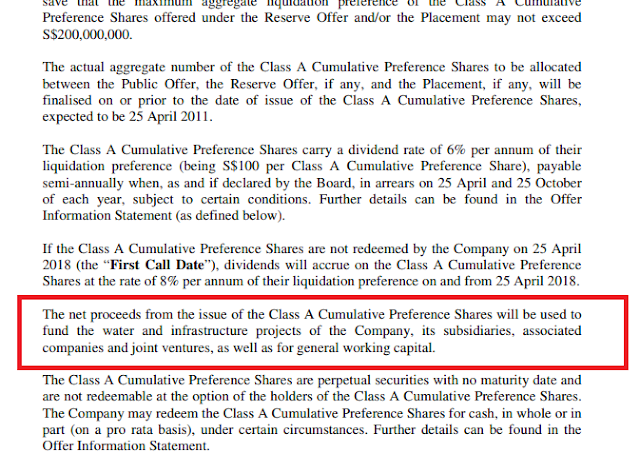 Why didn't Hyflux conduct any equity rights issuance to raise funds, but instead chose to conduct a sale of preference shares and perpetual securities to retail investors who may have used their CPF or SRS account? As a comparision, Ezion and Tiger Air conducted rights issuance to shore up funds. Rights issuance result in the company issuing new shares, and if existing shareholders do not subscribe to the new shares, their voting power ( control) in a company decreases because the total number of shares in the market increases and they hold a proportionally smaller share of the total number of shares in the market. Daily share buybacks have the opposite effect. Existing shareholders do not need to come out with any funds. The company will use its funds to buy existing shares from the market, thereby reducing the total number of shares in the market. Existing shareholders have more voting power(control) in a company as they own a higher proportion of the total number of shares in the market. Why did your proportion of Employee Stock Option as part of your compensation decrease along the years? In other words, why did your compensation in cash increase along the years, given that Hyflux is in need of cash in a capital intensive industy and needed to raise funds from retail, non-accredited, unsophisticated investors, who counts retirees among its ranks using perhaps the CPF and SRS? As a comparison, Ezion management reduced their compensation drastically. Tuas One is coming online in October 2018 based on filing with the Energy Market Authority. It will contribute about 136 MW of electricity. Will Tua-One be like Tuaspring in terms of being unprofitable? What is the rationale for some of the board of directors to be so long serving in the board? Why is your role of CEO and Chairwoman not separated? By acting as a CEO and chairwoman, together with a majority stake of 34% of the company and with long serving directors on the board, it seems that there is no check and balance in the company. Based on this article, it states that in 2011, Hyflux bidded for $0.35 per cubic metre while the next closest bid was $0.52 per cubic metre. The other bids were more than $1 per cubic metre. If it is true or indeed Hyflux bidded very low, can you share what is the rationale? If it is untrue, can you shed some light on the prices that were bidded for the project. What are the steps you are taking to save Hyflux? As a comparison, Ezion management used their personal assets to secure funding and reduced their pay drastically. Are you going to step down and seperate the role of chairwoman and CEO? Are the long serving directors going to step down too? Why did you go into Hyflux shop and develop ELO water , and in the end, controlling Hyflux shop through the dividends-in-specie and offer? Did you knowingly offer the dividends-in-specie when you know that Hyflux is going to be under a court ordered moratorium, as the dates of the events are so close? Since dividends from Hyflux can only be paid if coupon holders of N2H and BTWZ are paid coupons, now that BTWZ ex-coupon which is payable on 28 May is stopped, could Hyflux shop be returned back to Hyflux.